When we hear the word “proposal” in a business goal setting, what immediately comes to mind is a lengthy piece of a document written for clients to persuade them in getting a job. It involves a lot of writing, concentration, patience, and rewriting. After it’s all done, it will be pitched to clients who hold the final decision. There is an endless wondering if the proposal will be approved or not. You begin to worry if you wrote too much or less. However, this kind of worry can be solved by writing a one-page proposal. Yes, you read that right. Proposal Samples can be condensed into a single page. This is a smart way of pitching ideas without writing too much. A one-page proposal explains the project itself in a few words. It proposes a specific action that will prompt a “yes” from the clients. Furthermore, it explains the reasons and factors for the action. There are some benefits of writing a one-page proposal theme. Since your clients are busy people, trimming down your proposal into a few words is an effective call for action. The brief message of the proposal addresses the client’s ability to think quickly. The lesser information you provide, the quicker the decision will be. You may also see the research proposal templates. Going beyond the one-page format can lead to some serious damages. The first page might not be read when another half-page is added. Some clients want a shorter material that they can absorb within a few minutes. Your purpose of the one-page format is to show an easy course of action. There is some kind of beauty when the message is conveyed in one page. In one-page proposals, you are after what the client thinks of your proposal. You are putting ideas in the minds of your audience through it. Since it is short, it’s easy to identify the flaws and polish the proposal. You may also like the one-page marketing templates. How to Write a One-Page Proposal? Writing a usual proposal takes time. It is nerve-racking and difficult at times. A one-page proposal saves you from this, but it challenges you as well. Brevity is the real king in this kind of proposal, so it is better to keep it real simple. 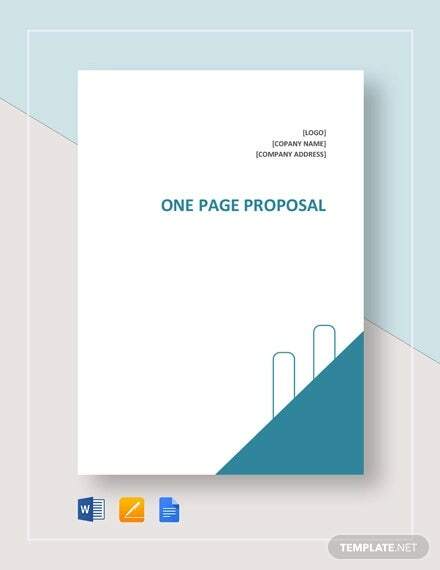 You may also like the proposal templates. A noteworthy advice when writing a proposal is to write it in simple language. Highfalutin words often result in the proposal being junked. Write in a tone and language that is suitable for everybody. The title of your proposal defines its entirety. Write a catchy title to attract the reader’s attention. This condenses your proposal and makes it readable. You can also add a subtitle to give the title more details and flavor. This will hook the reader into reading the rest of the proposal. You may also like the work proposal templates. This is where you reveal the intention of your proposal. It answers the question on the reader’s mind on what happens if he accepts the proposal. In this part, you explain in simple language the fruitful possibilities once they accept the proposal. You may also see the sample proposal templates. Since proposals have more than one objective, you can put secondary goals to highlight the main goals. These will spark the interest of your readers and might consider accepting your proposal. 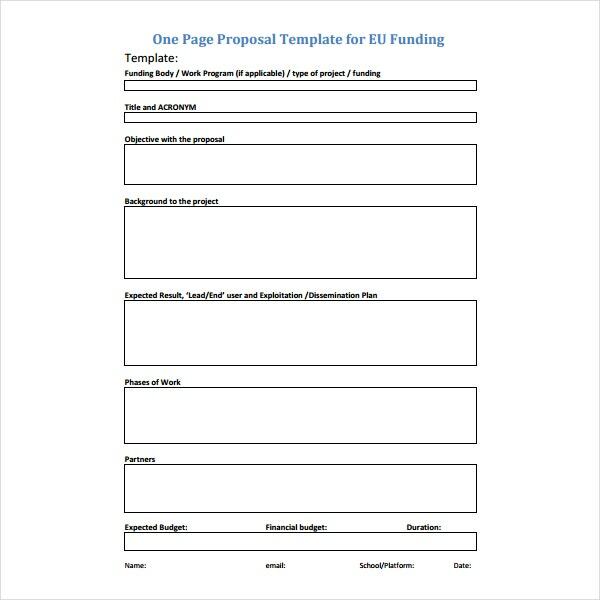 You may also like the free proposal templates. 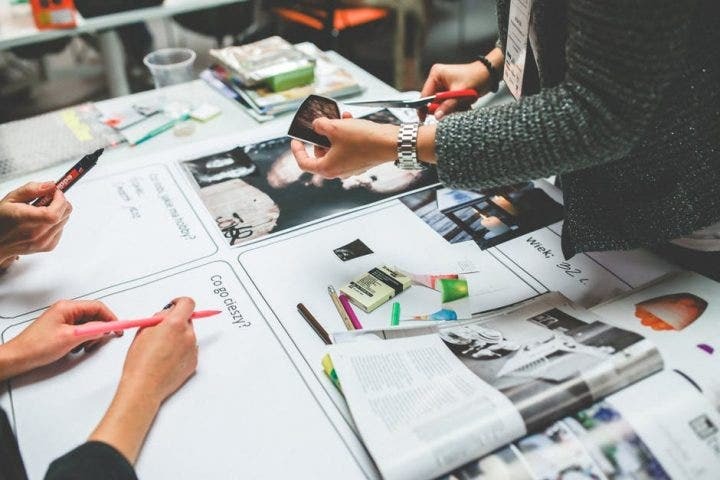 Selling your idea in the rationale. This is the longest part of the proposal to give it your best shot. Two or three paragraphs for this are good enough in telling them why your proposal should be accepted. Explain to your clients the needs of the situation, and the benefits and advantages of your proposal. The rationale is your one and only ticket to showing them that you’re prepared. You may also like the design proposal templates. All project proposals need some financial backup. In this part, you discuss money matters such as cost and revenue issues, as well as the budget for the proposal. Clear up financial commitments and tell the readers where their money will go. Tell the clients about what’s happening. Giving a clear overview of the status quo helps the readers understand the situation. Also, include the accomplishments of the project and the preparations if there are any. This part is a perfect way to build credibility to your proposal and your reputation as well. 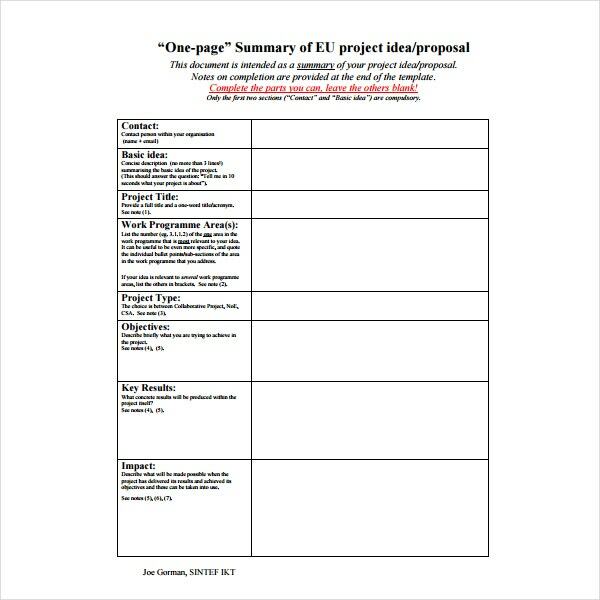 You may also like the work proposal templates. This is the finishing line of your proposal. This is where you answer the client’s question on what exactly he wants you to do. Ask for something beneficial to you and to them. It can be a financial support, recommendation, or a loan. You will get what you want and meet their demand at this stage. You may also see the excel proposal templates. We hope this information on one-page proposals are helpful. Writing a short form of a usually lengthy proposal is a challenging task. It urges you to be more creative in playing with words. But the good thing here about this kind of proposal is it saves you the fear of being rejected by writing long proposals. 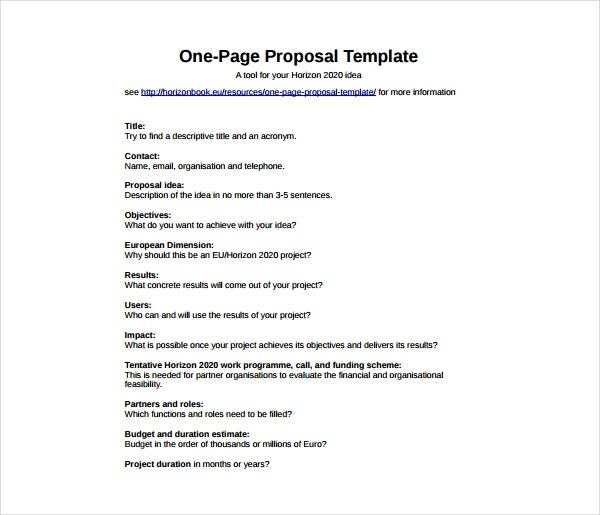 You may also like the proposal templates in pdf.